Improve the Value of your Vehicle! Paintless Dent Removal at the Dent Shop! 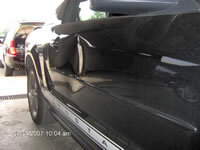 We remove dents, dings and hail damage without sanding, filling and painting your car. There is no risk of matching paint and getting overspray on other areas of your car. The paint remains untouched. The vehicle retains its original factory finish and value. 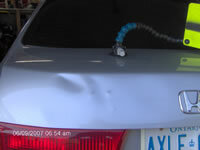 You save money as dent removal is less expensive than traditional autobody repair. You Save time - Many repairs can take less than an hour! It is difficult to match the new sophisticated factory painting systems in non-factory environments. Fortunately, today there is another option! Paintless Dent Removal! At the Dent Shop, our proprietary professional Paintless Dent Removal Process works from behind your vehicle's damaged metal to remove damage. Our process uses uniquely designed tools and highly skilled technicians to massage and flex the metal back to its original shape without the need for bondo and repainting! This process works exceptionally well for many applications including hail damage repair. Proudly Servicing the Greater Toronto Area.